DBS Marina Regatta 2018 | JustRunLah! In conjunction with DBS’s 50th anniversary, DBS is taking the seventh edition of the DBS Marina Regatta to another level. 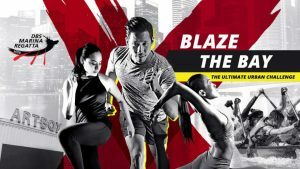 DBS will be extending the event over two weekends instead of one and also, collaborating with Under Armour, an American sports brand, to introduce the most technically challenging obstacle course in Southeast Asia. DBS Marina Regatta will be on 26-27 May and 2-3 June, held at The Promontory @ Marina Bay. It is open to everyone from adrenaline junkies, urban athletes to families looking for some fun by the Bay.